It was the summer of 1985, and Pete Oppenheimer was competing in the Annual Margate New Jersey Memorial Lifeguard Championships. Thirteen beach patrols were competing, and Pete was rowing singles for the first time. 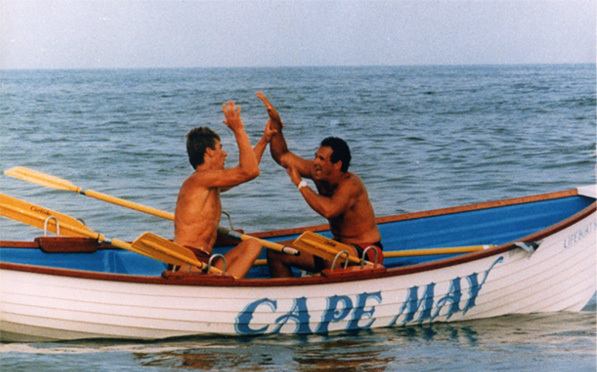 He was representing the Cape May Beach Patrol, rowing singles. This was a 500 yard race, and Pete was in fifth place when he made the turn toward the beach. Out of nowhere Pete saw a huge wave approaching. Miraculously his boat “got on” the wave. He stroked into it and it kept pushing him as he kept from flipping over. With a giant lift, the wave shot Pete’s boat up onto the beach, ahead of everyone else. When Pete received the trophy the announcer stated that the wave was the best wave ride he had seen in over thirty years. When Pete got a new license plate for his car, it read WAVE ONE. When he opened the company in 1989, the name WAVE ONE was a natural!